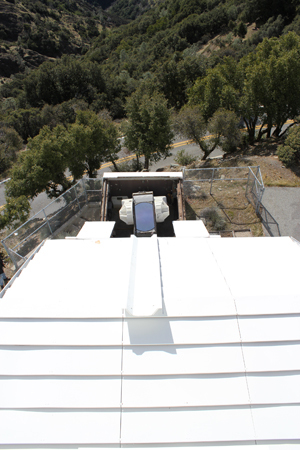 The 0.6-meter Coude Auxiliary Telescope (CAT) is an independent feed for the Shane 3-meter Reflector's coude spectrographs, enabling their use when the Shane itself is configured for prime or cassegrain observing. The CAT has the same focal ratio (f36) as the Shane's coude focus; its beam passes through the same entrance slit, and at the same angle, as the 3-meter's beam. The two telescopes thus appear optically identical to instruments beyond the slit, and virtually all instructions pertaining to their use with the 3-meter apply equally well to their use with the CAT. The CAT is almost always used to feed the Hamilton Echelle Spectrometer. The CAT has only 4% the collecting area of the 3-meter, but due to its advantageous plate scale, it is relatively more efficient in parctice, delivering 5-6% of the 3-meter's throughput, depending on conditions. New users please note: The CAT is an observer-operated telescope. All new users must be checked out by a resident astronomer on their first night. Retrurning observers may request a refresher. Please make requests for support on your time application. Direct questions to the Support Astronomers, sa@ucolick.org.